I have had my ups and down with the cape trend. Some seasons I pay adoration to the armless staple, while other times I find myself completely bored with the whole idea. In an attempt to overcome my cape-induced fatigue, I even spent several seasons mastering the art of the make-shift cape, also referred to as coat slinging by Vogue, and dutifully draped my coat, armholes, sleeves and all over my shoulders. However, putting ones arms into their coat sleeves seems to be back on trend, and therefor so is the idea of the mainstream cape. It wasn’t the heavy hitters like Valentino or Stella McCartney that brought me back on board with the trend. It was the color blocking I spotted at Chloe and Adam Lippes, mixed with the modern and structured styling and use of layers that the designers behind The Row presented that made me a true believer in the staple again. This is probably why I simply could not say no to the colorful confection that I am donning in today’s style post. Once I added a belt and my favorite pair of brogues, any doubt I had before quickly dissipated, and once again I was right back on the cape bandwagon. That’s a really gorgeous cape and truly looks like a million $$ on you!! Styling is everything, huh? Thanks!! OMG Miranda that cape is just stunning. I love the colours & how you’ve styled it – gorgeous! I love this sophisticated look.. 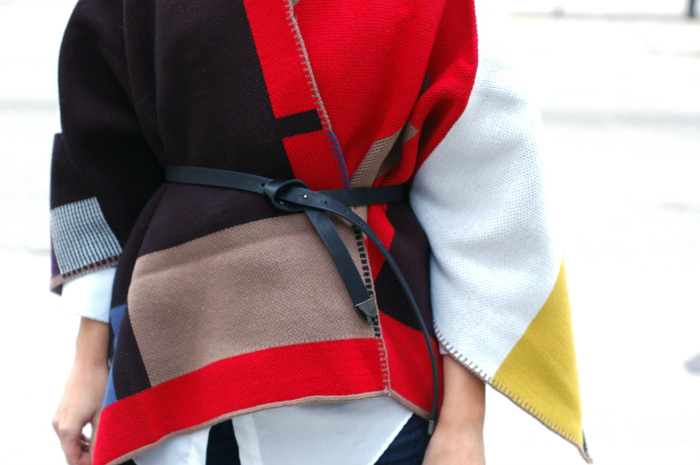 The cape has mysteriously become chic again. I wasn’t a fan until Burberry brought one out and everyman and their dog started to wear them. I love your styling, belted and all. This I can envision on me. Yeah, I think it can cross into boho, which is not my style, so this belted and brogued look kept it modern and I could definitely see you donning something similar, babe. I feel like I never see your hair up, but I LOVE it! Well, when the wind is blowing at crazy speeds, sometimes a top bun is your best friend- lol. I’ve been exploring the cape trend too. This one is stunning – I love all the colors! 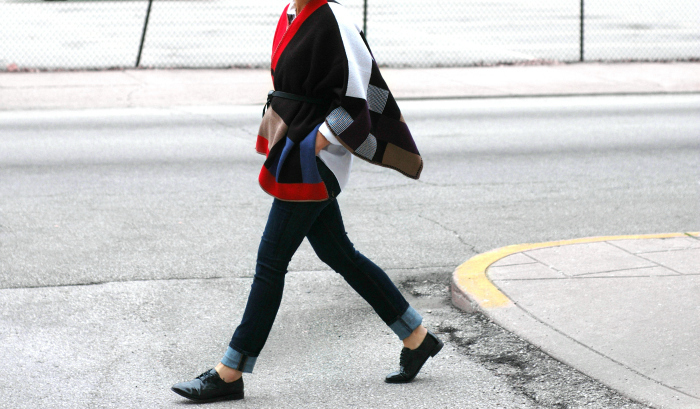 The new spin designers are putting on capes make me excited about the trend for sure! 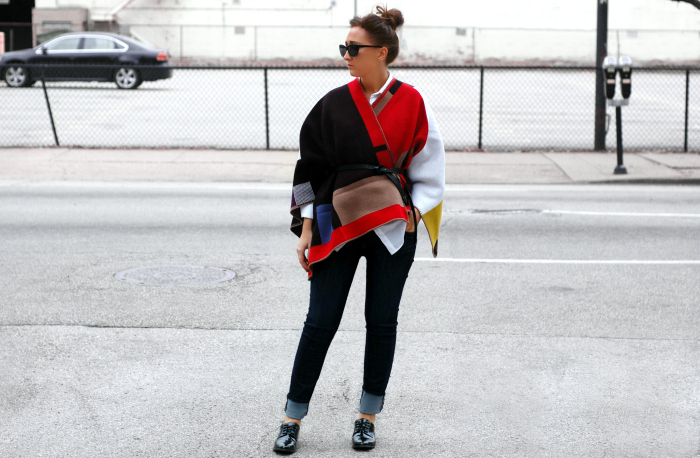 This cape looks amazing on you – gorgeous colors and love how you styled it as always!